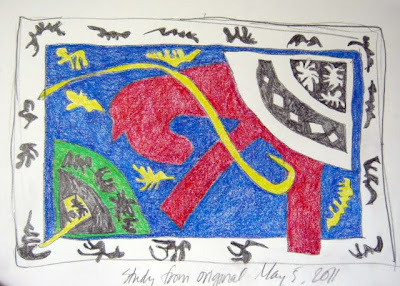 I forgot to bring my own pencil when I was studying the Matisse Jazz Series at the Ryerson library in Chicago. So I used a few of the short stubby library pencils to do this drawing as I looked at the original print. As an artist, I needed to do more than just look and read and write and type. Drawing from observation helps me feel my way around another artist's hand. Laying out the composition of this piece gave me a deeper appreciation of the complexity of the image. The abstract shapes and bold colors make the space look deceivingly simple. And that original piece is not a drawing; it is pochoir, stenciled gouache on paper. 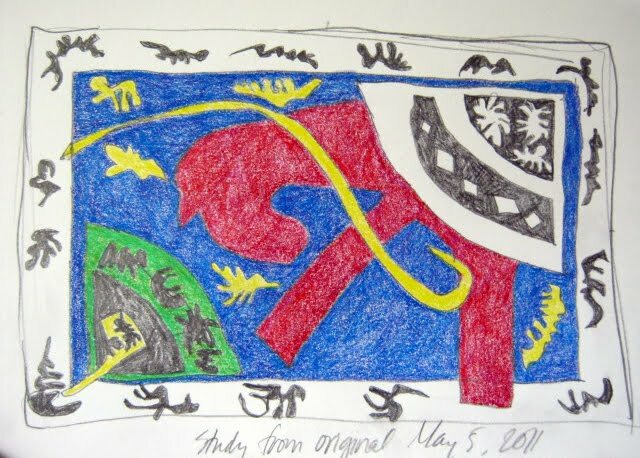 Matisse talked about the immediacy of the paper cut-out, more visceral than drawing and then coloring in a shape as I did in my study. My next step will be to approach my materials in a similar way, to cut and paste or cut and print.